Off The Record: Has Anyone Seen My Mojo? Can you believe that it is the 1st of September? I don’t know about you but I really struggle to get back into the swing of things after taking a long weekend off. It’s official, I am the most unmotivated person ever, so to get myself back on track I am setting myself a 9 week challenge to whip myself into shape. I have some dietary, fitness and career goals I want to achieve in the next 9 weeks, which I have broken down into manageable pieces so as to avoid setting myself too big of a challenge. I won’t be sharing with you right now what the goals are, but once the 9 weeks are up I will be sure to let you know how I have got on. ♥ Finding another 27 Gromit’s at Bristol’s Gromit Unleashed. ♥ Exploring Bristol! Honestly I have never taken the time out to explore Bristol and I was completely amazed by the beauty of the city, we had drinks by river, listened to music in the park and and had a boogie at a Jazz festival – all in one day. ♥ Clothes shopping!! The most amazing feeling after taking a year off buying new clothes. ♥ Taking the time to give myself a manicure, my nails have been seriously neglected these past few months. ♥ Poaching Wars on ITV presented by Tom Hardy, I am not going to lie the show has had me in tears but it is also amazing the lengths people are going to to protect some of Africa’s most endangered animals. I have found tickets to a lecture by the Royal Geographical Society called ‘The Changing Face of the Rhino”, next month which I would really like to attend. ♥ Catching up with all my old school friends, it must have been over a year since I saw them last and it was lovely to hear what they have been getting up to. ♥ Getting my eyebrows done-HD style! It included dying them, plucking them, cutting them, waxing them AND threading them! It sounds intense and I bet you’re thinking I must have had some sort of serious mono-brow for all of that but I promise I didn’t! I would totally recommend this treatment though, my eyebrows look really defined now! ♥ Having a tapas date with James! Mussels, pitta, calamari, feta, spinach, olives, etc ohhhh it was so yum! ♥ Celebrating Lauren’s birthday with a garden party, acoustic music and a hog roast! It was perfect. Our last little grasp of summer! 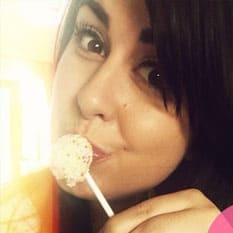 ♥ Cake pops! (Pah! As if I couldn’t include them in this round up!) If you follow us on Instagram you’ll know I went a little crazy with them this week and made a whole bunch of them for the weekend festivities! ♥ A Lake Tahoe real wedding – complete with the family dog! ♥ Business tips with Ryan Gosling – Answer Your Emails! Enjoy the rest of your weekend my lovelies, I’m off to relax for the rest of the day in the hope that tomorrow I wake up feeling wayyyyyy more motivated! Thanks for including my faux wax seals in your lovely roundup! Our pleasure Sara! I wish Ryan Gosling would open his emails because I have heard nothing back from him 😀 Lucy has had such an amazing idea with that post, I for one am hooked!